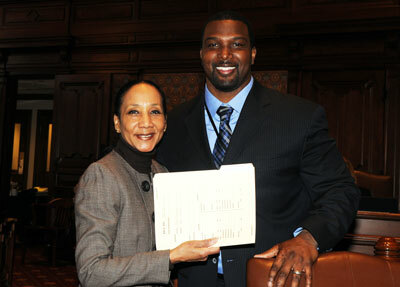 “Today was a happy day in the Illinois Senate. I’m excited we passed a measure for pension reform. It’s a good plan which saves the state money, exempts retired teachers and insures that the state makes their pension payments in the future,” said Illinois State Senator Napoleon Harris (D-Flossmoor). State Senator Napoleon Harris (D-Flossmoor) is sponsoring a measure inspired by student athlete Rocky Clark that protects high school student athletes who get severely injured while playing sports. The legislation would ensure student athletes are covered. While playing in a football game for Blue Island’s Eisenhower High School on Sept. 15, 2000, running back Rasul “Rocky” Clark was paralyzed. Rocky received care for the next 10 years through a catastrophic medical insurance policy that was provided by his school. That coverage stopped in 2010 when Rocky’s care exceeded the $5 million cap on the policy. Rocky died on Thursday, January 5, 2012. 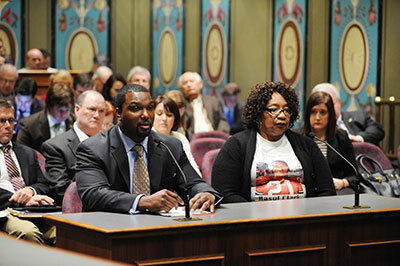 Rocky’s mom, Annette Clark, joined Senator Harris in a Senate committee meeting on Wednesday. Annette traveled to Springfield to tell her story. She spoke about how hard it was to care for Rocky after his insurance ran out, and they even had to mortgage her house and quit her job. Annette is still mourning the death of her son, and hopes no other family has to go through this. This measure, Senate Bill 2178, passed Senate committee and will soon be heard in the Illinois Senate. With an effective law that assists many families facing foreclosures about to expire, State Senator Napoleon Harris (D-Flossmoor) acted this week to extend the law for another three years. This measure gives struggling homeowners time to obtain counseling before losing their homes to foreclosure. Since this law was passed, more than 48,000 homeowners have received homeownership counseling. The 30-30-30 law requires lenders to send homeowners a warning 30 days after their missed mortgage payment and allow them 30 more days to seek counseling. After the homeowner receives counseling, they have another 30 days to present a plan to the lender. If the borrower does not seek counseling or follow through with their plan, the lender can foreclose their house. The measure, Senate Bill 56, has passed the Illinois Senate and is now waiting to be heard in the House of Representatives.